Matt Profaci, 25, a student at Drexel University, has treatment-resistant depression and bipolar disorder. He uses ketamine to manage his disease. 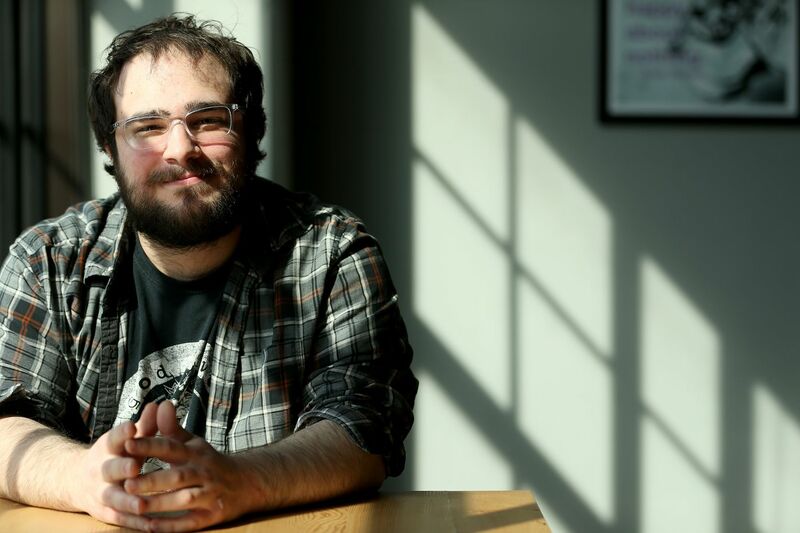 Matt Profaci, 25, has struggled with bipolar disorder since he was diagnosed at age 13. He tried several treatments, including many different medications through the years, but “nothing seemed to stick,” Profaci said. Last year, he became suicidal. Esketamine is the newest drug approved for depression. Here are 7 things to know about it. Then Profaci, a student at Drexel University, tried ketamine, a drug that came to market more than 50 years ago as an anesthetic but that has been used off-label in the United States since about 2002 for treatment-resistant depression, helping those who don’t respond to at least two other medications. After about six intravenous ketamine infusions, Profaci’s suicidal thoughts disappeared, and his depression gradually lifted. Profaci’s story is not unique. According to studies, 50 percent to 80 percent of patients with treatment-resistant depression get relief from their symptoms with ketamine infusions, and no one knows exactly why. At Actify Neurotherapies, which has a blossoming number of treatment centers around the country, including ones in Bryn Mawr and Princeton, the response rate has been an average of 70 percent, according to the founding psychiatrist and chief medical officer, Steve Levine. Now the FDA has approved esketamine, a nasal spray and a derivative of ketamine, which will go under the brand name Spravato, developed by Janssen Pharmaceuticals. Steve Levine, founding psychiatrist and chief medical officer at Actify Neurotherapies. Esketamine is a nasal spray that contains basically half the active ingredients in a ketamine infusion, Sanacora said, and it remains to be seen whether it is as powerful as ketamine at easing depression. Still, the early results are impressive. In one randomized trial in adults under 65 with treatment-resistant depression, about 70 percent responded to esketamine after a month — much higher than the 50 percent response rate that is generally considered successful. “One of the best things about ketamine and esketamine is that there’s definitely hope,” said Dennis Charney, a psychiatrist and dean of the Icahn School of Medicine at Mount Sinai in New York. Charney was one of the original researchers in the development of esketamine. “Depression is one of the most painful of all diseases,” Charney added. While waiting for an antidepressant to take effect, “weeks can seem like years.” Because ketamine and esketamine often work within a day or a couple of days, “this is very important for patients” — especially those who are suicidal, he said. Dennis Charney, psychiatrist and dean of the Icahn School of Medicine at Mount Sinai. All of this action increases the neuroplasticity of the brain and works “really fast” with fewer steps than with traditional antidepressants. Therefore, there are probably fewer opportunities for the antidepressant reactions to get blocked along the way, Levine said. But even with all the research, doctors are still unsure exactly how ketamine and esketamine produce the effects they do. The speed and efficacy of ketamine was a lifesaver for Silvia Zsoldos, 88, who has experienced decades of mental-health problems that began after a traumatic childhood in Finland. When Stalin bombed Finland in 1939, Zsoldos was in the street alone and went home to find her house empty. Eventually, a neighbor took her to a cemetery, where her family was alive, seeking refuge from the bombs; there, Zsoldos had a “complete emotional breakdown” and has suffered from post-traumatic stress disorder ever since. In her 50s, Zsoldos, who now lives in Delaware, was washing dishes, when she suddenly found herself under the kitchen table. The sound of bombers on a television war movie had triggered her PTSD. Silvia Zsoldos, 88, used ketamine to control her depression. After her first ketamine infusion, however, she was “tapping her feet,” ready to get back to her life as a businesswoman and author. During her infusions, which last 40 minutes, followed by a recovery period, Zsoldos relaxes. “I don’t really think about anything, and sometimes there’s an insight,” she said of the drug’s famous mind-altering effects. Sometimes, people feel an altered sense of where their body parts are in relation to the rest of their body, or they feel as if their arms are floating or that they are sinking. Occasionally, patients have intense psychological responses to ketamine, but that isn’t typical, and more often than not, people describe the experience simply as “strange,” Sanacora said. Profaci said he feels a “general warmth” and often his lips will get tingly or numb during infusions at Actify Neurotherapies’ Bryn Mawr office. “It’s like having dreams while you’re acutely conscious of being awake,” he said. Because of the cognitive and sedating side effects, patients are not allowed to drive after an infusion. Profaci said that he feels a “little dazed for a couple of hours” after a dose and that he usually takes the afternoon off from classes. Zsoldos usually returns home and goes to bed, she said. In addition to the potential side effects of ketamine and esketamine, the price tag for ketamine sessions can range from about $400 to $800 per infusion, plus additional consultation fees, according to the Ketamine Advocacy Network. Insurance doesn’t usually cover ketamine. Esketamine, which will cost approximately $600 to $900 per session, is more likely to be picked up by insurance because it has FDA approval. Another benefit of esketamine’s FDA approval is that it will likely lead to more regulation of ketamine itself, which has been offered sometimes in less than responsible pop-up clinics that tout it as a wonder drug while veering from the science. Plus, researchers are hopeful that the FDA approval of esketamine will lead to more studies and potentially result in the production of more swift-acting antidepressants, Charney said. Though esketamine has been more extensively researched, little is known about the long-term effect of ketamine infusions or esketamine doses. And though the immediate impact of the drugs is often dramatic, maintaining the benefits over the long run can be an issue for many people. Profaci receives infusions every three to four weeks. He and his doctor are talking about developing a plan to maintain the improvement he has experienced. He also takes a cocktail of antidepressants and other drugs to manage his bipolar disorder, Profaci said.